One morning in 2015 I woke to the sound of my neighbours’ mango tree being cut down. I asked the team cutting up the tree where the wood would go? When they said landfill, I asked for some. This is part of what they called a biscuit. It has been drying for 2 years and is ready to be shaped into a table for the van. 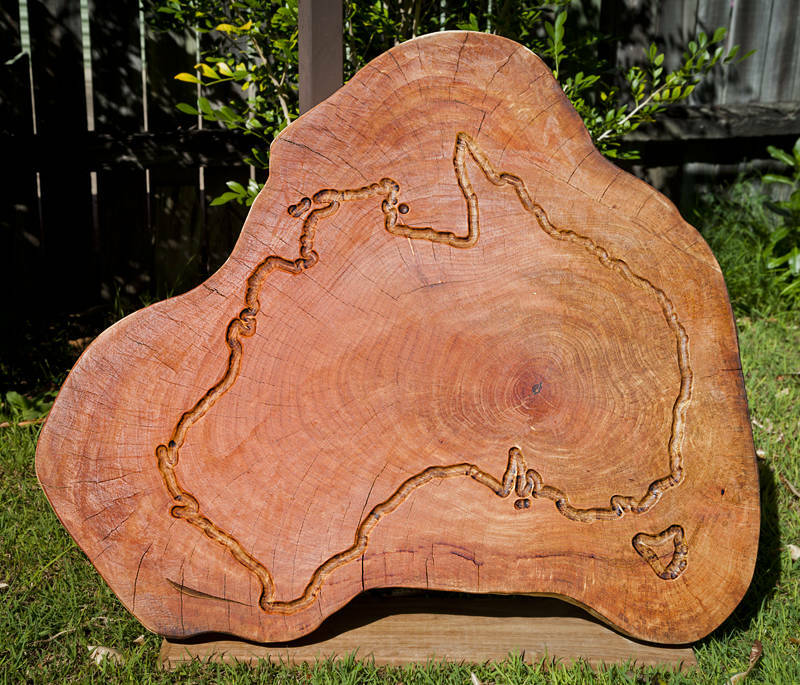 Last weekend I used a wood router to make the outline of Australia so you can run your finger around and feel the coastline. In keeping with the egalitarian nation, I positioned the centre between three states, Queensland, South Australia and New South Wales. Good to see you are keeping up your woodworking skills. Did you draw it on before you free-hand routed it? We still have a few slices from our long deceased Beech tree. They have been kept covered up so should be well seasoned or eaten by now. Making sawdust is my second favourite hobby. Pin pricked the outline through a map then joined the dots with a router. Reminded me of working on the beach tree except the mango wood is softer.